If you haven' t heard of poke—pronounced “Poh-KEH”—then don't worry. Here is your introduction. 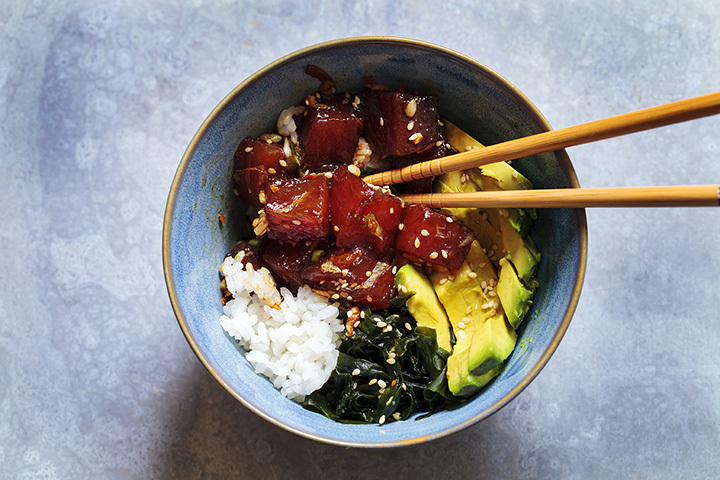 Poke is a Hawaiian dish that draws on more than a few elements of sushi, but does so in a very specific and ultimately very Hawaiian fashion. Start with high-end fish—sashimi-grade tuna is usually best—cut it into bite-sized cubes, add a few other elements like chopped green onions and a sauce like sesame oil, then let it marinate over rice. If you're interested in eating fish in a way you've never had prepared before, Michigan is your place. From Grand Rapids to Royal Oak, here are the best poke places in the state. Head out to Grand Rapids to check out the Wikiwiki Poke Shop, a poke shop that offers not only poke bowls, but poke bowls with themes and clever pop-culture names. Try such memorable fare as the Wiki Minaj, featuring ahi tuna, poached shrimp, spicy octopus and more. All bowls can be offered up gluten-free or dairy-free, and every bowl can be converted to a “large” bowl for an extra $4. With locations in Bloomfield Hills and Birmingham, you'll have your choice of where to land some prime poke, and it probably shouldn't come as a surprise that any place specializing in poke would also offer sushi. With both pre-designed and custom poke bowls available, you can either try one they've already hit on, or pick from a slate of options to make it just the way you want it. With so many different combinations to try, you'll be enjoying poke bowls regularly for some time to come. Out in Royal Oak, you'll find Yuzu Sushi, which now boasts access to the poke bowl concept along with its sushi and sushi burritos. Yuzu Sushi has three different poke bowls to its credit, the Spicy, the Wasabi, and the Hawaiian, each of which features its own special blend of ingredients. Beyond that, you'll not only get access to various kinds of sushi, but also sushi burritos (which are a delicious option too). Fuze in Kalamazoo is described as an elegant, intimate gastropub, so you know they'll have a wide range of options on hand for its patrons to sample. Tuna poke is a part of that substantial list, featuring cucumber, avocado, jalapeno, jasmine rice and rice wine, scallion, sesame, chili oil, fried wontons and wasabi tabiko. That's a pretty hearty poke bowl, and for those who'd rather have something else, you can start with veggie banh mi or hand-cut french fries prepared in duck fat, rosemary and truffle oil, or togarashi. Caledonia's Jaku Sushi doesn't exactly go long on the poke bowl—you'll have your choice between salmon and tuna—but poke is just the start of what you'll find therein. Whether it's calamari tempura you're hungry for, or a taste of nikojume—a deep-fried stuffed mushroom—you'll have a wide range of options at good prices awaiting you here. Tuna poke is a mere $8, while salmon is just a dollar more. That's a great price. With a name like "Poke Fresh," it's hard not to be a little encouraged to eat there as freshness is exactly what you'd want most out of a bowl involving raw fish. Head over to Howell to check this place out for yourself, where bowl sizes are determined by the amount of protein involved, whether one, two, or three scoops. It's not just tuna, either; you can get salmon, scallops, crab salad, tempura shrimp and more in a wide range of different bowls. Purists and experimenters alike should find plenty to enjoy at Poke Fresh, and if not, you can always build your own bowl! It's a new way to sushi, so says Sushi Coup in Rochester Hills. Given that they specialize in sushi and poke bowls, but also chicken wings, that's not such an outlandish proposition. Tuna poke leads the way in Sushi Coup's “Signatures” menu, and going from there, diners can get salmon, tempura and more. The wings, meanwhile, require a minimum of 10 minutes to cook and are made to order, so adjust your schedule accordingly. Round out your meal with fries, various soup and salad sides, and your choice of drink for a complete experience. The Poke Lab at East Lansing boasts a wide range of poke options. Start with a make-your-own arrangement and from there proceed to one of eight separate poke bowl combos. Featuring a panoply of possibilities from tuna and salmon to scallops and octopus—and that's just the protein—you'll have plenty to work with here. From there, check out the various sides like eel or uni don and the impressive slate of desserts involving fruit, rice, and occasionally, beans.